Happinet is a comprehensive entertainment trading company that boasts either top or near-top market share in each of its four main businesses: toys; visual and music; video games; and amusements. Leveraging its unique market intelligence and proprietary logistics systems, Happinet applies the strengths of each of its partner manufacturers and retailers to maximum advantage. Happinet plans and proposes sales environments tailored to the characteristics of each store, marshaling infrastructure such as logistics and information systems. These systems attach value-added to the products we deliver. Logistics, the physical connection between Happinet and its business partners, lies at the heart of business operations. We build out the latest in logistics systems to provide high quality at reasonable cost. The continuous exchange of profitable information between Happinet and its business partners is an essential part of the Company’s operations. Information systems enable this exchange by serving up a steady stream of timely information. As an intermediate distributor, Happinet is uniquely positioned to gather information from both manufacturers and retailers. Based on that intelligence, we analyze the daily shifts in product sales to secure and supply the necessary inventory, to never miss a sales opportunity. We drive logistics systems that are second to none in the industry to perform precise and timely shipments, delivering products to stores across Japan. Happinet captures information through some of the most effective sales-support systems in the industry. Drawing on that information, we look carefully at the sales strength of each product to determine sales methods that best respond to the varying needs of each store and retailer. We meticulously plan product display methods, sales development methods and other strategies and table our proposals with optimal timing. We forecast sales based on feedback from retailers, providing valuable data for use in setting production volumes. We provide our customers with the latest information on sales, consumer needs and much more, furnishing a vital resource for product development. When products are ordered, Happinet draws on real-time information on quantities shipped, received and in inventory and shares this information with manufacturers. Happinet plans and proposes sales environments that capitalize on the characteristics of each store, as well as promotions, events and other sales strategies. We maintain appropriate inventories at all times. 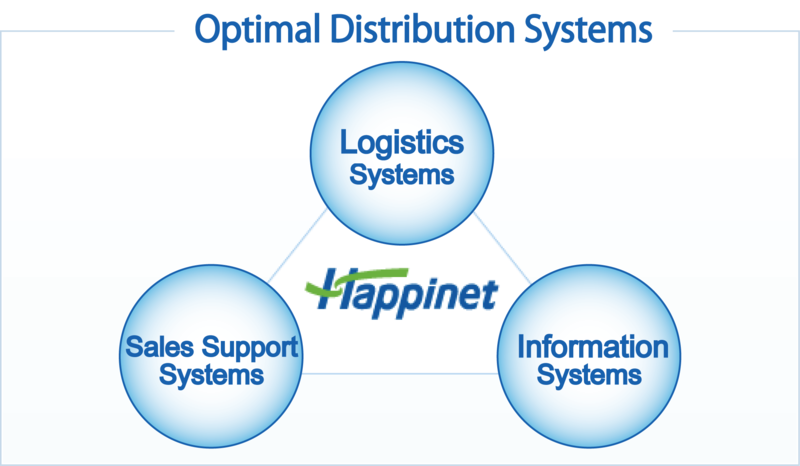 Happinet supplies products from a logistics center in the top echelons of the logistics industry. Happinet sales representatives carefully manage the status of sales at each individual store. Sales reps adjust schedules and quantities as they accept orders. Which products are selling well? How well are they selling? What do consumers demand? The answers to these questions vary from day to day. Happinet carefully gathers and analyzes this market information. Happinet sells boys’and girls’　toys, electronic toys, trading cards and other toys. The Company sells video and music software, with emphasis on the DVD and CD markets; produces its own line of products; and acquires products for exclusive sale. Happinet sells consumer game software and hardware and related peripheral equipment launched on the Japanese market. Happinet installs and operates capsule-toy vending machines and sells an array of amusement-related products.